At CareerJoy, we pride ourselves on the client experience. Our coaching programs are fully customized and we offer a wide range of services as Canada’s Career and Leadership Coaching firm. One of our biggest assets is adaptability: we assist our clients in navigating an ever-changing workforce. In the past year, due to popular demand, we have introduced more extensive LinkedIn training, a wider variety of webinar offerings, and increased networking opportunities and information sharing through social media. 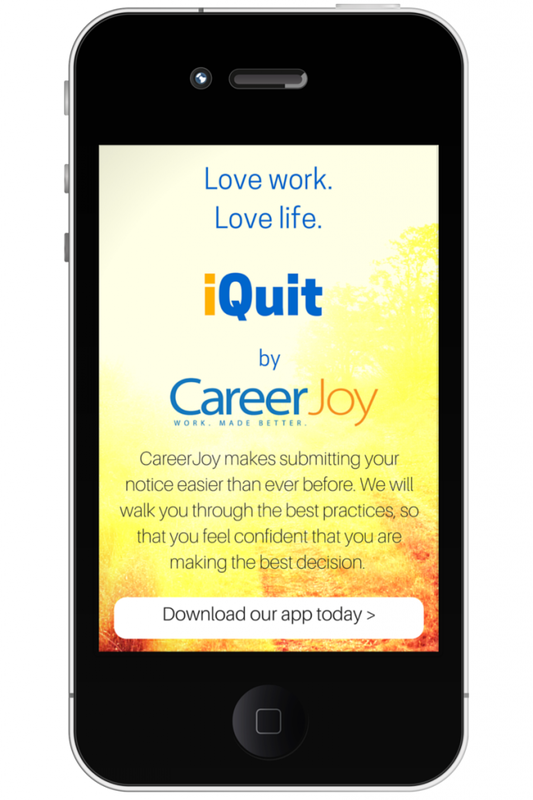 Today, we are proud to announce the official launch of CareerJoy’s first (but not last!) app available on Android and iOS markets! Let’s be honest for a minute. Who wants to deal head-on with quitting their job when transition time looms? Whether in-person with a traditional resignation letter or via email, the awkwardness of a professional “break up” has never been easy – until now. In a world where technology reigns in almost every industry (Amazon is delivering books by drone; you can swipe left or right on a potential suitor with popular dating apps), CareerJoy noticed a major opportunity in the workplace. With iQuit, we give you control of how and when you would like to break the news to your employer. In addition to assisting you through transitioning out of your current place of employment, CareerJoy can also support you in your job search so that you can land a new role faster and with less stress. P.S. Need more support than one app can provide? The Career Transition Program is a 1-1 customizable program that assists with the strategic planning for your next best career move and landing that new role. For more details, please contact our Client Services Manager, Brittany Knapp, atbrittany.knapp@careerjoy.com or 1-877-256-2569 x 4.